Global renewable power generation capacity rose 161 gigawatts (GW) to 2.006 terawatts (TW) in 2016, marking the eighth consecutive year of 8-9 percent annual growth, according to IRENA (International Renewable Energy Agency). At that rate, capacity will double again in eight to nine years. Solar power was the fastest growing category of renewable power in 2016, rising 32 percent to 71GW. Wind power capacity also rose at a well above average 12 percent annual rate with the addition of 296GW. Nine GWs of new bioenergy capacity came online in 2016, up 9 percent year-to-year. That marked the largest annual increase in bioenergy capacity IRENA’s registered to date. Just under 1GW of new geothermal power capacity came online as well. “We are witnessing an energy transformation taking hold around the world, and this is reflected in another year of record-breaking additions in new renewable energy capacity,” commented IRENA Director-General Adnan Z. Amin. “This growth in deployment emphasizes the increasingly strong business case for renewables which also have multiple socio-economic benefits in terms of fueling economic growth, creating jobs and improving human welfare and the environment. Cumulatively, hydropower continues to account for the lion’s share of installed renewable power generation capacity worldwide, accounting for 56 percent of the global total. 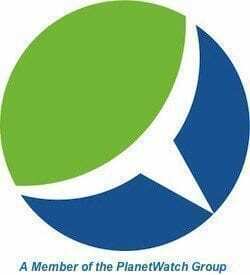 Furthermore, hydroelectric facilities of 10MW or more accounted for three-quarters of the total. 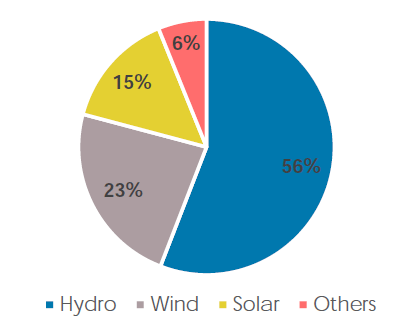 Wind (cumulative 467GW) and solar (cumulative 296GW) accounted for most of the remainder. In addition, 110GW of bioenergy capacity, 13GW of geothermal and some 500MW of marine energy capacity (tide, wave and ocean) was online as of year-end. Regionally, Asia continued to set the pace for renewable power generation last year as new capacity rose 13.1 percent year-to-year to 94GW. Cumulatively, Asia renewable power generation capacity totaled 812GW as of end-2016, 41 percent of the global total. Renewable power generation capacity in Europe rose 21GW, up 4.4 percent, to reach 487GW cumulatively, 24 percent of the global total. North American capacity increased 7.8 percent, or 24GW, to a cumulative 330GW, a 16 percent share. Among other world regions, Africa registered a notable increase in renewable power generation capacity last year. Twice as much was installed across the continent in 2016 – 4.1GW – as compared to 2015, propelling Africa to a second place ranking worldwide in terms of new capacity growth. Delving deeper into the latest data, China (+19GW), the USA (+9GW), Germany (+5GW) and India (+4GW) accounted for nearly 75 percent of the growth in wind power capacity in 2016. Brazil added another 2GW. 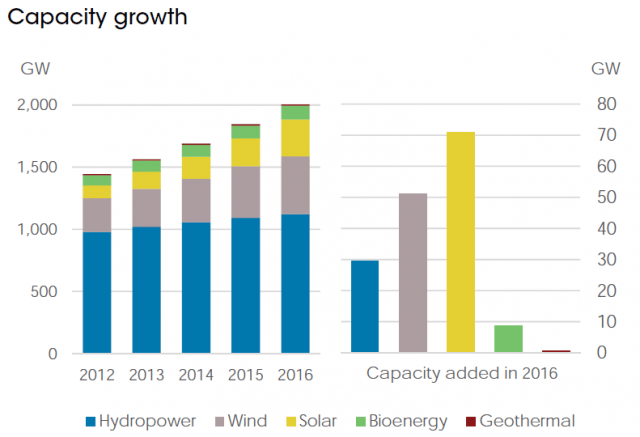 As it did with wind power capacity, Asia accounted for most of the new bioenergy capacity installed worldwide last year. Increasing by 5.9GW, Asia’s bioenergy capacity is approaching that of Europe, which accounts for 34 percent of the global total. Asia also led the way in terms of new solar capacity in 2016 with the addition of 50GW. New installations in China (+34GW) accounted for nearly half the total installed globally last year. Elsewhere, 11GW of new solar capacity was installed in the US, 8GW in Japan and 4GW in India. Growth in solar, as well as renewable power generation overall, has been slowing in Europe. Five gigawatts of new solar power capacity came online in the region last year, bringing the cumulative total to 104GW. Most of the growth occurred in Germany and the UK. IRENA also highlighted growth in off-grid renewable power generation, which rose to reach 2.8GW globally as of year-end 2016. Off-grid hydroelectric power accounted for about 10 percent of the total. Off-grid bioenergy – small-scale gasifiers, biogas plants, and isolated industrial facilities – made up around half. Growth in off-grid solar power capacity merits attention as well. Off-grid home solar installations accounted for 40 percent new capacity worldwide in 2016 as innovative, entrepreneurial off-grid solar home startups grow, industry “ecosystems” diversify and markets crop up and expand in Africa, Asia and other developing world regions.